We know you like getting your stuff as fast as possible, so we try to get every order shipped in 24 hours or less. The Uniseal Warehouse won't rent or sell your personal information for marketing purposes. 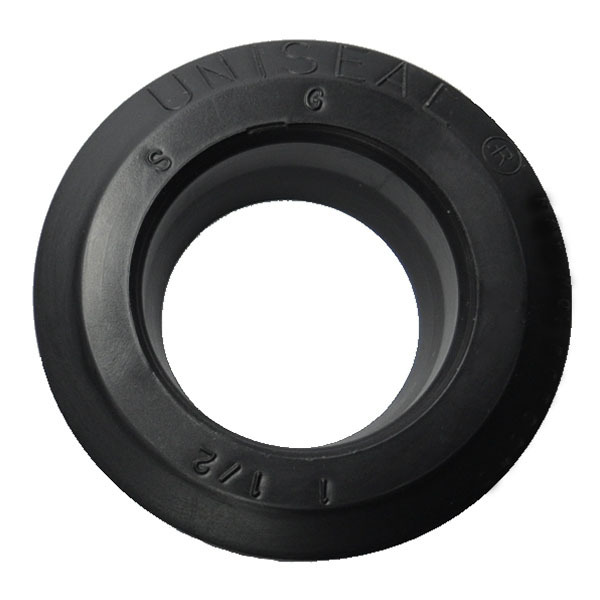 Uniseals are used to attach pipe to just about any container in situation where bulkheads will not work. 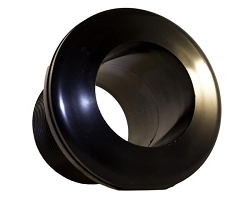 The most common use is on curved surfaces such as storage drums, buckets, and even other pipe. 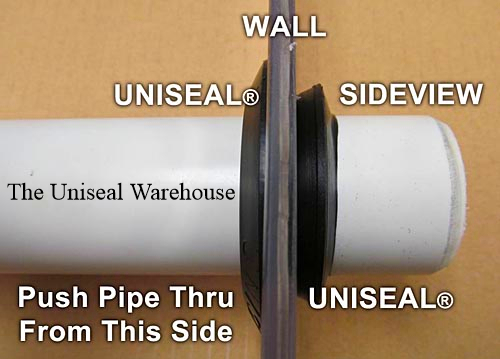 Uniseals are provided in sizes intended for standard schedule 40 pipe (common household plumbing pipe). For example, a standard 1 1/2" schedule 40 PVC pipe requires a 1 1/2" Uniseal. We recommend using a hole saw for cutting holes where a Uniseal will be placed. After cutting the hole, remove any fragments of material left behind to ensure a good, watertight seal. The Uniseals I ordered were delivered a day ahead of schedule, were of great quality, the size I ordered, and are working perfectly in my fish tanks and filters. When I set up my next tank I'll be ordering again. I like the concept of the seals but for me it was leaking and I had to put putty around the seal to prevent it from leaking. Was able to stop leaking. It's about time a product lives up to the manufacturer's claims. These seals worked perfectly in my RV waste and grey water tank refurb. They are so much better than the factory original seals and easy to install. Delivery was super quick (5 days to Canada!) and a technical question which was asked of the tech team was answered in minutes. Overall this was a very satisfying purchase and I highly recommend the product and AussieGlobe. these things are great. I used them to connect three rain barrels together. NO LEAKS!!! great price. They work fantastic. I am more than pleased with my purchase from this vendor. Will do it again. They seem to be good quality rubber and fits well on the PVC pipe. I have used a variety of sizes of these, and they work great. So far, I've used them on my aquaponics garden grow beds, and fish tanks. I've also used them in the home-made manifold in my solar water heating experiments, and I just completed my permanent solar water heating system, where I used these Uniseals for the input and output pipes to the water storage tank, as well as on the improvised back-up water heating element. 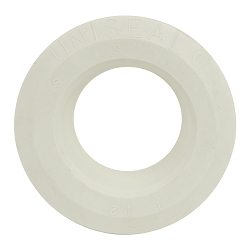 In summary, I think that these Uniseals are great, so easy to install, and not one of them has leaked over the four years that they have been installed in my aquaponics garden system. 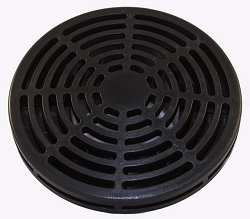 lastly, they are not only easier to install than bulkhead bushings, but they are also considerably less costly. I highly recommend them. Very quick shipping. Product was easy to install and has this far preformed flawlessly. Great product, wish i would have realized sizing was different than ecpected. Make sure to reference sizing chart!!! Product is great. No leaks. Easy to install if you bevel edge of pipe and lubricate. Love the product. Quality product. Works exactly as expected for my aquaponics setup. The state made us put rainwater collection on all of our down spouts. We are a mulch company and have an abundance of IBC totes that our dye is shipped in. I used the Uniseals to join them together to make banks of totes so I wouldn't have to empty them as frequently. They work great, and are easy to use. The banks fill up evenly as I put them as low as possible. I've recommend this product to quite a few people as the stop by to inquire about our rain water collection. This uniseal works great on my project. It snug fit a 1 1/2 in pipe to a bucket. No leaking. Excellent product. I'm glad I found this site. I built a pond filter and used PVC bulkhead fittings where I needed to. Unfortunatly I miscalculated the needed volume and had to build it larger. The glued fittings were a waste. I ordered 1 1/2 inch uniseals and the worked so well and the price was less than 1/3 what I paid for the bulkhead fittings. I will always use uniseals where ever possible. First time trying a slip fit seal, works perfectly. I am going to use more of these seals in various sizes in the future. They work great. Excellent quality and fast shipping. Highly recommended. Will be used sometime in the future..
At The Uniseal Warehouse we make returns as easy as possible. Our mission is to provide you with the best products and the best service in the industry. We understand that sometimes, customers change their minds about products that they order or simply do not need them anymore. We also know that customers are cautious about Return Policies since they are often tricky and misleading. Our goal is to make the return or exchange process trustworthy and as simple as 1-2-3. If for any reason you are not completely satisfied with your purchase, you may return the item within 30 days of delivery of your order. For orders placed during the holiday season from November 15th to December 31st, the return period is extended to 60 days. Products must be in original packaging and in a new and resalable condition. Any product that was used or fully/partially installed is non-returnable. All returns must be made via our Return Procedure by filling out an RMA form in the MY ACCOUNT section. There are few non-returnable products & services that may be offered on our website. It will indicate clearly in the product description if a different return policy applies. Order cancellations can only be requested prior to shipment or in some cases. If the return of an item was caused by an error on our or a manufacturer's part, we will cover the shipping fees. Option 1 (Slower) - Use the standard return procedure to request an RMA for the part you need exchanged. In your request please specify the exact item(s) you would like to exchange to. Upon receipt of your returned product we will process an exchange and ship the new part. 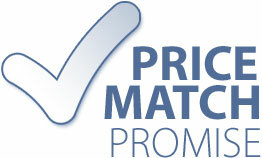 If there is a difference in the price, you will be either refunded or charged the difference. Option 2 (Faster) - Order the new part online or over the phone so it can be shipped to you right away. Then request an RMA using a standard Return Procedure for the part you would like to return. Upon return of the part a refund will be issued promptly. We all know that accidents happen sometimes. If your product(s) will arrive defective, damaged, or simply incorrect, please contact our customer service department as soon as possible. Please do not attempt to use or install the part! We will send you a replacement part and provide you with a prepaid return label to return the defective part. Product(s) must be returned to us within 30 days. If the damage was caused by a shipping courier, we will schedule a damage pick up by the courier. When a replacement part is requested to be shipped prior to the return of original merchandise, we must temporarily authorize your credit card until the original merchandise is returned. When you request a cancellation of an order or a part it may take up to 72 hours to process your cancellation claim. This process may involve voiding orders in computer systems, removing items from backorder logs, having operations personnel pull items from production schedules and sometimes stopping orders at the shipping dock. Also note that sometimes products ship more quickly than expected, so we recommend that you do not purchase alternative products until receiving final confirmation of your cancellation. After we accept your return, you will be issued a refund via the same payment method as you had originally used to place the order (Credit Card, Paypal). The refund amount will be composed of the original purchase price minus shipping charges. You will be sent an email confirming receipt of the return and your credit. Please allow an additional 5-7 days for the credit to appear on your account. Copyright 1996 - The Uniseal Warehouse. All Rights Reserved.